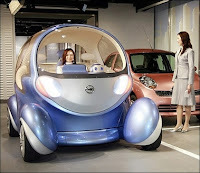 Japan's Nissan Motor Co. on Friday unveiled a new version of its egg-shaped Pivo concept car that can drive sideways and has a small robot to assist with navigation or calm down angry drivers. The Pivo 2 three-seater electric car has wheels that can turn 90 degrees for easy parallel parking. Like its predecessor, which was unveiled two years ago, the new Pivo has a cabin able to revolve 360 degrees, eliminating the need to reverse. A round-eyed robot head sitting on the dashboard has cameras that can tell when a driver is getting sleepy. "You look tired. There's a coffee shop 500 metres ahead on the left," it told a driver with drooping eyelids during a recent demonstration. It can also nod or shake its head, helping to improve the mood of irate or glum drivers. The car has "by-wire" technologies that use electric signals in the steering and braking. Unlike the first Pivo, it has no axles. Instead it has four separate electric motors, allowing the wheels to turn further than a conventional car.